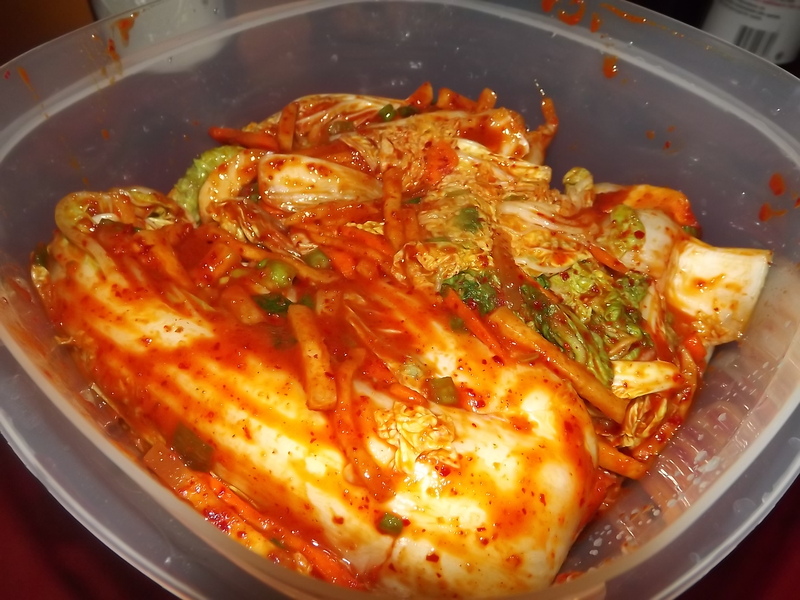 Making kimchi is a really easy thing to do. I know it seems daunting, but I promise, you'll love the end result! Best of all this recipe is vegan, but easily made more traditional. If you use gluten free tamari, it's also suitable for those with gluten allergies. You need to start out by salting the cabbage. This step is easy I promise. Follow along with the video. Cut the cabbage head into 4 pieces like shown and rinse under cold water. Shake the excess water off, and sprinkle salt into each leaf. Don't skip this step, if you don't salt it well enough the end result isn't very good! Leave the cabbage in a glass bowl to set. After 1 hour, toss the cabbage over, put any larger and thicker pieces towards the bottom. If you want you can spoon over the juice to help soak better. After another hour (2 hours total) check the cabbage, it shouldn't be gooey but softened. If you taste a piece it will have a slight crunch, but slightly salty. Rinse the cabbage 2-3 times under cold water. Make sure to rinse off each leaf. You don't want excess salt in your kimchi. Set the cabbage in a strainer to dry out some while you prepare the porridge. Add 2 cups of cool water to a saucepan, and whisk together 2 tablespoons of sweet rice flour (often called mochiko because of the brand name). Make sure you remove ALL lumps before you turn the heat on. Turn to medium high and do NOT stop whisking. Once you notice the mixture starting to thicken, reduce heat to medium and cook it for about 2 minutes. It's very important to keep mixing to prevent lumps. After 2 minutes, shut off the heat and stir in your sugar, soy sauce (or fish sauce), and red pepper powder. Then transfer to a blender jar. If you had an immersion blender (stick blender) this would work better. Add your mixture to blender along with your ½ apple or pear, garlic, and ginger that you have peeled. Blend on high until all the ginger and garlic are mixed in. Let this mixture cool to around body temperature. Don't skip this step or you'll cook the cabbage. Once the mixture is cooled, mix together with the carrot, green onion, and daikon (or Korean) radish. As shown in the video, spread a little mixture onto each leaf and outside of the cabbage. Put into, preferably, a glass jar with a tight fitting lid. An old pickle jar would work great for this. Pack it down and you're done. Let this sit at room temperature overnight, up to 2 days depending on the season. You want it to smell a little sour and you'll see bubbles from the bacteria in the cabbage. Transfer to your fridge and it'll be good for weeks, couple months even. Obviously you can eat it right after making it, but after 2 days is better. The juice can be used for soups or pancakes and the longer the kimchi sits in the fridge the more sour it tastes. We love it! If you want more traditional kimchi, replace the soy sauce with fish sauce. Also if you are making this for someone who is allergic to gluten PLEASE make sure the tamari you use is certified gluten free!! I cannot stress this enough! Do NOT use table salt for salting the cabbage, you will end up with gooey cabbage. The apple/pear is optional but adds a yummy mellow flavor to the kimchi. The sugar is also optional, but if you're a baby with spice like I am, it really makes a difference. You can add as much or as little red pepper powder as you want. I don't like it very spicy so I added ½ cup, but you can add 1½ cups if you like it very spicy!